A STUDY ON NUTRITIONAL STATUS OF SCHOOL CHILDREN IN RURAL, SEMI URBAN AND URBAN AREAS OF CHENNAI. The health and nutritional status of children is an index of national investment in the development of its future manpower. According to World Health Organization, protein energy malnutrition refers to “imbalance between the supply of protein and energy and the body’s demand for them to ensure optimal growth and function. This imbalance includes both inadequate and excessive energy intake; the former leading to malnutrition in the form of wasting, stunting and underweight, and the latter resulting in overweight and obesity”. The consequences of child malnutrition are enormous and are intertwined with the development of society. Malnutrition affects the child’s physical and cognitive growth and increases the susceptibility to infections and severity of diseases while having adverse implications on income and economic growth indirectly. According to UNICEF data, 90% of developing world’s undernourished live in Asia and Africa while 40% of the world’s malnourished live in India. The 2013 Global Hunger Index Report ranked India 16th, which represents the serious hunger situation. The National Family Health Survey (NFHS) data indicates that 43% of children under 5 years of age are underweight and 2% of them are overweight. In India, we face a double jeopardy of malnutrition i.e., children from urban areas are affected with problems of over-nutrition while those from rural area suffer from effects of under-nutrition. The long term consequences of malnutrition on a child-turned-adult are issues of deep concern. Under-nutrition impairs the child’s immune system and weakens the defenses against other diseases. Whereas over-nutrition contributes to childhood obesity and leads to the early onset of hypertension, Diabetes mellitus, coronary heart diseases, orthopedic disorder and other respiratory diseases. School age is the active phase of childhood growth. Poor nutritional status in children leads to high absenteeism and early school dropouts thereby affecting the literacy rate of the country apart from affecting health status of the children. On the other hand, increasing lifestyle changes in urban areas has led to the emergence of over-nutrition and childhood obesity. To evaluate this changing trend and to determine the burden of malnutrition, we attempted to do a cross sectional study to assess the nutritional status of school children (11-14years old). To determine the nutritional status of children based on their BMI and waist hip ratio and its relation to various factors like gender, area of residence and socio-economic status. After being approved by the Institutional Ethical Committee of Stanley Medical College, a cross sectional descriptive study was carried out in the year 2011 over a period of 3 months from June to September involving 300 children in the age group of 11 to 14 years. Three schools were selected one each in rural area, semi urban area urban area. 100 children from each school were selected as subjects for the study. Data regarding the subjects’ socioeconomic background, religion, dwelling place, three day diet recall and type and duration of physical activities per day. Also their anthropometric measurements including height, weight, circumference of waist and hip were recorded. We have recorded body weight to the nearest 0.1 kg using a standard balance scale with subjects barefoot. Height of the children from the floor to the highest point on the head was recorded when the subject was facing directly ahead, barefoot, feet together, arms by the sides. Heels, buttocks and upper back were made to be in contact with the wall when the measurement was made. The height was recorded and rounded off to the nearest 1 cm. BMI (weight in kilograms divided by the square of the height in metres) of the children were calculated. The waist circumference was measured at the level of umbilicus. The hip circumference was measured at the widest part of the buttocks. Waist hip ratios were calculated. Data was analyzed at the end of 3 months. Based on the statistical analysis done at the end of the data collection, the following results were obtained. Out of the 300 students assessed in the study, 55% of them were boys and 45% were girls; 39.67% belonged to age 11, 14.67% belonged to age 12, 19.33% belonged to age 13 and 26.33% belonged to age 14. Based on socio-economic status, 1.67% belonged to class 1, 17% belonged to class 2, 38% belonged to class 3, 42.67% belonged to class 4 and 0.67% belonged to class 5. On assessing the 300 children for BMI, 67.33% were found to be underweight, of which 29.67% were from rural areas; 6% were found to be overweight or obese, of which 4.67% were from urban areas. The percentage of under-weight children was 65% in semi urban area and 48% in urban area in contrast to 89% in rural area. Of the 100 children assessed in rural area, only one was found to be overweight and no one was obese. Among the 100 children assessed in the semi urban area, 3 were overweight. Whereas in urban area, 7 children of the 100 were overweight and another 7 were found to be obese. Thus, in urban area, almost 14% of the children were either obese or overweight. This percentage is significantly higher than the 1% and 3% found in rural and semi urban areas. 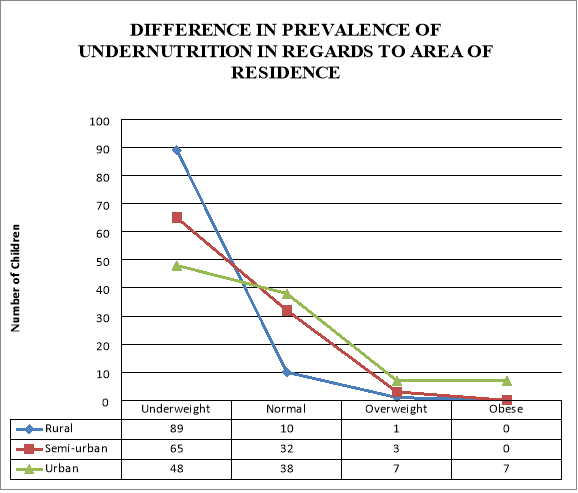 The percentage of the children who were categorized as normal according to their BMI was only 10% in rural but 32% and 38% in semi-urban and urban areas respectively (Figure 1). According to the data obtained, waist hip ratio of the children was also calculated. It is found that 20% of children in rural area and 32% of children in urban area fall under high-risk category of waist hip ratio. Waist Hip ratio more than 1 in boys and 0.85 in girls indicates an increased risk of metabolic complications. Though the frequency of high risk W:H ratio is higher among children from urban areas than that of rural areas, the difference was not statistically significant. The prevalence of underweight was 69.09% among boys and 65.19% among girls. This difference is not statistically significant indicating that there is no evidence of gender inequality in this study (Table 2). Socio-economic status of each child was assessed based on modified Kuppusamy’s scale. 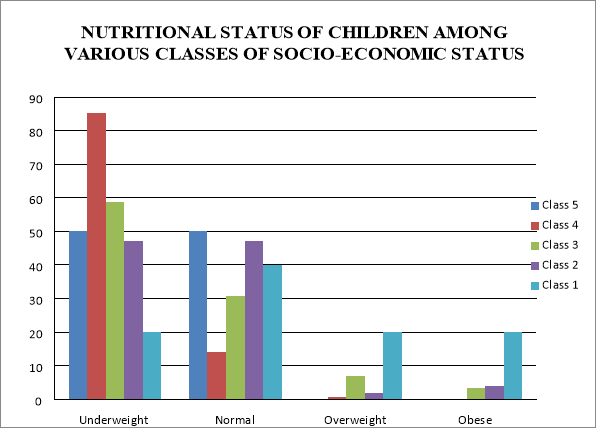 The prevalence of underweight children was 84.62% among socio-economic status class 4&5 and only 54.12% among socio-economic status class 1,2 & 3. It is evident that there is a significant statistical difference in the prevalence of underweight children in Class 4&5 as compared to Class 1, 2 & 3 ( Table 2). The children were also asked about their choice of games and sports. And it was found that nearly 45% of the boys and girls in rural area were involved in games requiring severe physical activity. The mean playtime of children from rural area was 1.6 hours/day. In semi-urban area, only 25% of the boys and girls were involved in games requiring severe physical activity whereas the percentage was only around 15% in urban area. The mean playtime of children from semi-urban and urban areas were 1.6 hours/day and 1.1 hours/day respectively. The three day diet history obtained from the children was analyzed and the average amount of calorie intake per day was calculated for all. The mean calorie consumption of the children, irrespective of their area of residence, was 1333 kcal. The mean calorie intake of children in rural area was found to be 991.7 kcal. 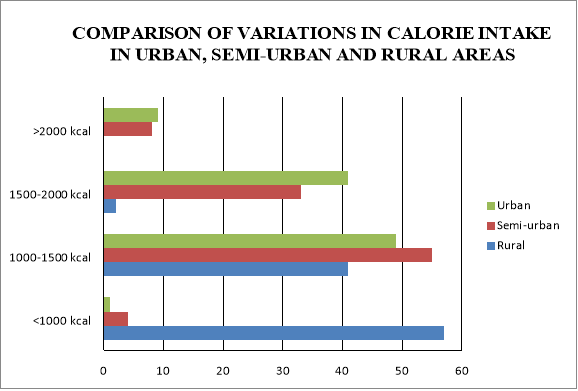 The calorie consumption was found to be lesser when compared to the mean calorie intake in semi urban and rural areas, which were 1461.7 kcal and 1545.7 kcal respectively (Figure 4). It was also found that the irregularity in taking meals was the greatest among the children in urban area. A healthy child becomes a healthy adult. Of the various factors which determine the health of the child, nutrition plays the most vital role. Low body weight is unhealthy and harmful in the way it has dire consequences on both physical and psychological well-being of a child. Decreased level of thinking, impaired concentration, irritable mood and heightened obsessiveness, while contributing to the psychological effects of malnutrition, undermines the academic performance of a child and leads to the development of a socially withdrawn child. On the other hand, malnutrition has a profound impact on immune system by weakening the defenses and aggravating the effects of infections. Infections contribute to malnutrition by a variety of mechanisms including anorexia and impaired absorption of nutrients. This shows that enteric infection begets malnutrition and malnutrition begets more infections. According to World Bank statistics, Child malnutrition is responsible for 22 percent of India’s burden of disease and contributes to an estimated adult productivity loss of 1.4% of gross domestic product (GDP). It has been estimated to play a role in about half of all child deaths and more than half of child deaths from major diseases, such as malaria, diarrhea, measles and pneumonia. Recent trends in India suggest that there has been a dramatic fall of severe underweight prevalence in urban areas (by 26%) compared to rural areas though the decline in underweight prevalence was considered inadequate according to UNICEF. Our cross-sectional study shows that boys are more likely to be stunted and underweight than girls though there was no significant gender inequality because of limited sample size. Our study determined the point prevalence of underweight children in relation to various factors like gender, age, area of residence and socio economic status while data from various studies indicated that decline in the prevalence of under-nutrition was lesser in girls compared to boys and lesser in scheduled caste & scheduled tribe as compared to other castes. Children with normal BMI constitute only 10% in rural areas while 38% of them had normal BMI in urban area. The collected data signify that under-nutrition is the burning problem in rural areas whereas urban areas suffer from the double jeopardy of malnutrition. It showed that mean height and weight of boys and girls was lower than the CDC 2000 standards in all age groups. The prevalence of underweight and stunting was highest among the age group of 11 to 13 years whereas wasting was more prevalent in the age group of 5 to 7 years. In this study, under-nutrition was found to be significantly more prevalent in girls than in boys. Data from our study says that probability of a child being undernourished is higher in rural area than in urban area. A study found that the prevalence of stunting was observed to be 52.3% and severe stunting was 25.1%. The determinants of this study included father’s occupation and income rather than the educational and occupational status of mother in the patriarchal society. In a multivariate study done in Brazil, stunting was found to be significantly associated with low economic income, inadequate protein intake and polyparasitism, especially Ascaris lumbricoides and Trichuris trichura. Evidences suggest that cell mediated immunity is depressed in malnutrition thereby increasing the duration and severity of infections with increasing degrees of malnutrition. The most common infection related deaths due to malnutrition were diarrhea and acute respiratory infections. Infant feeding practices and mother’s education status form the major determinants of Protein Energy Malnutrition. Better feeding practices were found to reduce the prevalence of stunting by 30%. Exclusive breastfeeding and partial breastfeeding were found to be more protective when compared to no breastfeeding. The median relative risk of death from diarrhea fell from 25 in no breastfeeding to 8.6 in exclusive or partial breastfeeding highlighting the paramount importance of breastfeeding in the prevention of malnutrition. Hence, it is necessary to cut down the causal factors of malnutrition before the child attains the age of 3 years. Better feeding practices, health awareness, sanitation, sustained availability of nutritious foods for all sections of people and enhanced access to healthcare services are essential steps to attain the Millennium Development Goals by 2015. Failure to invest in combating nutrition can have adverse impacts on potential economic growth. Integrated Child Development Services (ICDS) Scheme, launched on 2nd October 1975, is India’s unique programme to improve the nutritional status of children by providing supplementary nutrition, pre-school education, immunization and health education for pregnant and nursing mothers. Though ICDS is successful in many ways, decline in undernutrition in India is slower when compared with other developing countries because ICDS Scheme’s mainly focusses on food supplementation rather than health education and children aged 3-6 years rather than younger children (0-3 years). Our study reiterates the trends of malnutrition in relation to various factors and also highlights the need for differential approach in urban and rural areas to combat malnutrition. This cross-sectional study was undertaken to study the nutritional status of children aged 11-14 years and its relation to various factors like gender, area of residence and socio-economic status. This study also attempted to collect data on the amount of calories consumed per day, frequency and regularity of taking meals and level of physical activity in rural, semi-urban and urban areas. According to our study, 67.33% were underweight and 6% were overweight or obese. The prevalence of under-weight was found to be significantly higher in rural area(89%) than in urban area(48%) while urban area takes the upper hand in the prevalence of over-weight children. Our study also estimated that a child from rural area consumes an average of 991.7 kcal while calorie consumption of a child from urban area is much higher, averaging to 1545.7 kcal. Children belonging to socio-economic status Class 4&5, according to modified Kuppusamy’s scale, were more deprived of nutrients than the children of upper and middle class. Nutritional status was also found to be slightly poorer in boys than that of girls. The data collected also indicated that the mean calorie consumption of children in rural area was 991.7 kcal when compared to 1461.7 kcal in semi-urban and 1565.7 in urban area. However, the mean playtime of children in urban area was 1.1 hours/day with most of the children opting to play video games in their playtime whereas the mean playtime of a child was 1.6 hours/day in rural area. This data highlights a relative increase in calorie consumption in urban area with increase in sedentary lifestyle thereby setting a stage for the development of childhood obesity. Hence, we conclude our study re-emphasizing the various determinants of malnutrition and highlighting the changing trend in the nutritional status of children in urban, semi-urban and rural area. "Study on Nutritional Status of School Children." UKEssays.com. 11 2018. All Answers Ltd. 04 2019 <https://www.ukessays.com/essays/nutrition/study-nutritional-status-school-8558.php?vref=1>. "Study on Nutritional Status of School Children." All Answers Ltd. ukessays.com, November 2018. Web. 19 April 2019. <https://www.ukessays.com/essays/nutrition/study-nutritional-status-school-8558.php?vref=1>. UKEssays. November 2018. Study on Nutritional Status of School Children. [online]. Available from: https://www.ukessays.com/essays/nutrition/study-nutritional-status-school-8558.php?vref=1 [Accessed 19 April 2019]. UKEssays. Study on Nutritional Status of School Children [Internet]. November 2018. [Accessed 19 April 2019]; Available from: https://www.ukessays.com/essays/nutrition/study-nutritional-status-school-8558.php?vref=1.